If you are a paper crafter, the chances are good that you own a digital die cut machine. These excellent tools make paper crafting a breeze. No longer do you have to deal with rough cuts and sore hands These devices cut out shapes from paper with digital precision and accuracy. Your projects will rise to new levels of professionalism. We all want our paper crafting projects to be the best possible! If you are an advanced paper crafter and still don't own a digital die cutter, you really should consider buying one. It will make your life so much easier. We won’t lie; there is a learning curve, but once you master your machine, you will love the beautiful paper craft projects you will be able to make. We promise you; you will become obsessed with your cutter. Even though electronic die cut machines are on the expensive side, die cut files are not. 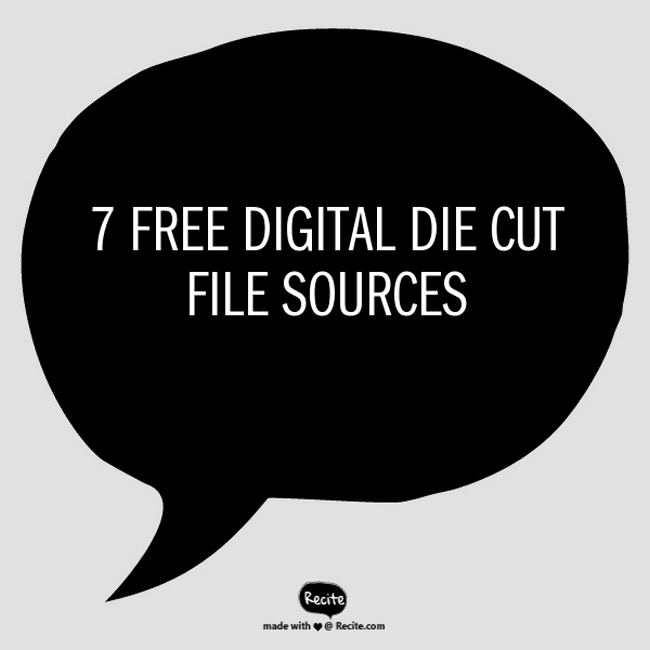 One of the great things about digital die devices is the number of free die cut files available for download on the internet. The design talent out there is incredible. We have a few website suggestions for you below that can help get you started on your search for free die cut files. Please play fair and don't abuse the generosity of other crafters. Always remember to respect the copyright rules for the work you download! Card makers will appreciate the square frame files offered for download at birdscards.com. The frames are cute, and the download includes many different types of files ( ai, Dxf, GSD, MTC, pdf, studio, and SVG)which should work with most machines. This site also has 333 more free digital cut files, along with digital papers, digital stamps, and free digital sentiments. You will find something appropriate for every type of papercraft project. You will be wowed with all of the choices! Monica from monicascreativeroom.se offers gatefold card die cut files and more. This site indeed has a variety of free die cut file downloads that every paper crafter will love. If you are planning a wedding or special event, you must check Monica's work out. All the files are of professional design quality and are free. We all love free! You can, however, donate to help fund the site and assist Monica in her file design endeavors. It is always a good idea to give back to the universe and give your Karma a boost. Juliana from 17turtles.com has seven free die cut files suitable for cardmaking available for download. They are cute and would also work well with scrapbooking or other types of papercraft projects. Check out Juliana's blog and Etsy shop for more crafting and digital die cut inspirations. She not only offers paper craft downloads but features other types of craft projects that inspire as well. There is something for everyone at 17 Turtles. Sherry from www.sherykdesigns-blog.com offers 80 free SVG files, 14 free Dxf files,13 GSD files, 14 studio files and a lot of other free files! One of my favorite downloads that Sherry presents is the free SVG/Hearts download. They would be perfect for a Mother's Day or Valentine greeting card. Make sure you also take a look at the many different projects and files that Sherry so generously shares with the crafting world. You will surely find something to incorporate into your next paper project. If you like birdcage projects, you will love this download. We especially love the paper favor box that looks like a miniature birdcage. We think it would be perfect for a wedding or shower favor box. Heather who owns the site and designs the projects also offers Inkscape and scal/eCal tutorials. Hope on over and take a look. There is so much to learn. The melstampz.blogspot.com website has been in business for a long, long time. This blog has got to be one of our all-time favorite crafting resource sites. Mel offers templates, tutorials and a variety of downloads all for free. If you are looking for something unique, you will probably find it here. Svgcuts.com is a business SVG file site, but that doesn't mean you can find free files here. They generously offer 34 pages of free downloads. You will be able to find many beautiful SVG files to fulfill you die cut paper crafting needs. SVGcuts is an excellent site to go to if you are interested in 3d projects. You will love the variety of plans offered for free, and also for purchase. We have given you a start for finding free die cut files on the internet. Now go out there and get crafting! I Love You to the Moon and Back! DIY Shadow Box Sentiment Wall Decor.